Repairs have begun on D dock at the Ala Wai Boat Harbor, shown here yesterday. 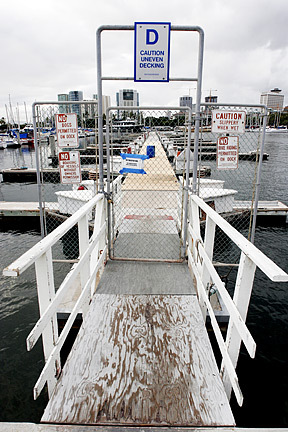 Contractors have began to fix an Ala Wai Boat Harbor dock that was in such bad shape that 46 boaters were forced to move elsewhere. "The concrete is bad. These piers are probably 20 years beyond their useful life when they were built. They're way, way beyond," said Ed Underwood, acting administrator of the Division of Boating and Ocean Recreation. But the latest work is only a temporary solution to extend the life of a pier by a couple of years. The Department of Land and Natural Resources contracted D & C Plumbing to fix D dock at the state-run boat harbor. Work is expected to be completed in October. Cost of the fix is estimated at $23,000. State officials hope to bring in as many as 50 boaters later this year once repairs are made to D dock. Director Peter Young said they are also looking into a type of mooring that involves no tying to a pier or dock -- to get more boats into the harbor. In July, 46 boaters were forced to move after engineers deemed the pier unsafe. Officials condemned the dock and a majority of the boaters were relocated to F dock or 800 row. » Galvanized steel frame to be bolted to the main pier. » Pier sections to be bound together. » Plywood about a 3/4 inch-thick installed on the surface of the pier. Young plans to return to the state Legislature to seek funding in capital improvements funds to permanently replace dilapidated docks at the small boat harbor. "We feel we demonstrated the need. We've come with a plan. We just want to implement that plan," he said. Young said $20 million will be requested in the budget for major improvements of the state's harbors and ramps. Of that figure, about $3 million would go toward permanent dock replacements at the Ala Wai Boat Harbor. A boat owner who asked that her name not be used said the state has long neglected the boat harbor. "It's like anything. If you don't maintain it, it goes to crap," said the boat owner. Her first slip was at D dock many years ago when it was still in good condition, she said. "I think it's a disgrace to this state to let the Ala Wai get into the condition that it is in," said the boat owner. In the past, the Department of Land and Natural Resources tried to get funding to fix the state's harbors, including Ala Wai, and ramps, Young said. But the department's request was not approved. Underwood urged boat owners at the small boat harbor to testify in the upcoming legislative session to support funding. "This should be our crown jewel harbor in Hawaii. And it can be. All we need is money," Underwood said. Once repairs are made to D dock, officials will look at B and C docks that have similar deteriorating conditions. Meanwhile, the bidding process is under way for F dock. Young said they have $1.5 million to go toward replacing the temporary dock currently in use. The original dock was demolished in February 2004 after it was declared unsafe.